Harry & David originally made a name for themselves with their artisan cheese and fruit deliveries. Now you can sign up for the Harry & David Chocolate Club and enjoy up to a year’s worth of gourmet chocolates delivered straight to your door. A monthly club that brings you artisan chocolates from around the world. The Harry & David Chocolate Club is not short of variety. Each month there is a pre-determined delivery, which prospective members can preview before signing up. They do not repeat their selections in the entire year – so members can rest assured there will always be something different delivered to their door. They do not seem to include exotic or local ingredients as part of their emphasis – instead, they just go for unique and fun varieties of chocolate. Some types of chocolate members can expect to receive include sea salt caramels, gourmet peanut butter cups, ice cream parlor truffles, dark chocolate truffles, chocolate cherries, and even chocolate fruit assortments. Harry & David are known for their exceptional quality and that is no different with the Harry & David Chocolate Club. Members can expect gourmet chocolates year-round regardless of which decadent gift arrives. Chocolates are acquired both domestically and internationally. They do not specify which chocolatiers are working on their selections, but they are local. There is nothing that makes their chocolates overly unique, but they play it safe by offering delicious, high-quality chocolates members are guaranteed to love. Like most chocolate of the month clubs, Harry & David Chocolate Club has one basic membership with three options: three month, six month and 12 month contracts. The prices are very competitive – and could arguably be cheaper than most. Prices range from $99.99 to $369.99 per contract and shipping is not included. Each shipment contains anywhere from 10 ounces to 1.5 pounds – depending on the chocolate being shipped. Information about the chocolatier is not sent with the shipments, but a detailed list of what is being received is. Also, when signing up, members can opt to replace their first month with a large chocolate-inspired gift. While members cannot receive discounts on future purchases, they do have other monthly club options to choose from to give to themselves or family and friends. Harry & David Chocolate Club does take their shipping seriously. Everything is packaged so that the food is never compromised and their chocolate club comes in very delightful packaging. They purposely gift wrap each monthly delivery that way their members can give away as gifts or if the membership itself was gifted, their recipients receive gift-wrapped selections each month. Unfortunately, the only drawback is that shipping is not free with this club. Currently they charge $6.99 per shipment. Luckily, Harry & David Chocolate Club is meant to be given as a gift more than given to yourself – but that doesn’t mean a person cannot order it for themselves. Because the memberships are designed for gift recipients, they come in special wrapping, with notes and definitely make the recipient feel special. There are no additional perks for ordering this membership as a gift though. The website can be finicky at times and there may be difficulty signing up for some people. But, overall, the website provides plenty of information about the club – including what is expected in upcoming club shipments. Members can also preview the types of chocolates in photographs on the site – so they know what each type of chocolate selection will look like. There is a tracking system for orders, membership management area, and members can also sign up for an emailed catalog. Harry & David takes customer service very seriously and have one of the more robust customer service options out there. That being said, members will be sharing their Chocolate Club questions with one customer support line for all other monthly clubs from the Harry & David line. Members can reach customer service via a toll-free number or via email. They are available Monday through Friday from 5am to 9pm PST and Saturday/Sunday from 6am to 8pm PST – which are by far the longest customer service hours out of all of the clubs. Also, they have an in-depth FAQs section as well as a live chat. Three Month Club: Includes three months of chocolate deliveries. Starts at $99.99 total plus $6.99 per shipment or a total of $120.96. Six Month Club: Includes six months of chocolate deliveries. Starts at $189.99 total plus $6.99 per shipment for a total of $231.93. 12 Month Club: Includes a full year of chocolate deliveries. Starts at $369.99 total plus $6.99 per shipment for a grand total of $453.87. Harry & David Chocolate Club is ideal for just about anyone. They offer excellent prices and the club itself is a great gift too. 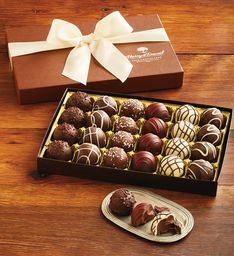 Their chocolate varieties are not anything unique, but because they are predictable, it is likely that just about any type of chocolate lover will appreciate and enjoy the shipments they receive with this club. There is a lot to love about Harry & David Chocolate Club. First, we love their brand. They have a long history of being reliable and delivering on their promises – which is always something great to find in a chocolate of the month club. Their selections, while nothing exotic or overly unique, are still great for just about anyone – making it an ideal club for all types. Unfortunately, Harry & David Chocolate Club is one of the few clubs that charges for shipping. Their per shipment price does increase the total cost of the membership – though their membership prices are relatively affordable compared to other clubs. Overall, we are very pleased with the offerings, prices and reputation that comes with a Harry & David Chocolate Club membership and we think most people that sign up for it will be equally impressed. A reliable, well-known chocolate club. Brought to you by the makers of monthly club deliveries, Harry & David. This Chocolate Club features gourmet chocolates and gifts year-round with a pre-determined schedule so you know just what to expect when you sign up.